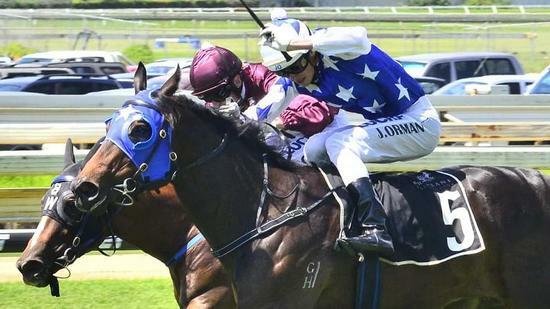 Kelly Schweida strengthened his hand in the Magic Millions in dramatic circumstances at Doomben. Gala Miss gave Schweida the second leg of the two-year-old double, after scoring one race earlier with Pocket Pistol, but only after an incident involving runner-up Button Pusher. Ridden by apprentice Carly Frater-Hill, Button Pusher was two lengths in front and headed for victory with 150 metres left to run but shifted in when struck with the whip, blundered and shied away from the running rail. Frater-Hill was almost dislodged but showed remarkable presence of mind to grab the filly's breastplate which enabled her to regain balance and stay in the saddle. As a result of the incident Button Pusher ($3.20) lost momentum which allowed Gala Miss, the $2.70 favourite, to overhaul her and score by three-quarters of a length. Schweida was glad he decided to run Gala Miss after having some misgivings about her fitness leading up to the race. "I was in two minds whether to run this filly because she only had the one jump-out going into this race and even though she went good in it she's a little porker and not fully wound up," Schweida said. "I said to the owner if she draws a bit awkward we'll wait for another day but then she drew the one gate so we decided to run. "Obviously the second horse was a bit stiff but we'll take the good luck when we get it." Schweida paid $170,000 for Gala Miss who is owned by an all-female syndicate which makes her eligible for the Magic Millions Women's bonus worth $500,000. Pocket Pistol, a $240,000 yearling purchase, bounced back from running last at his debut to score an all-the-way win in the Lite n' Easy Handicap after being backed from $6 into $3.50 equal favouritism. "He was three deep the other day and was still there at the 200 metres before he felt the pinch on the wet track," Schweida said. Apart from Gala Miss and Pocket Pistol, Schweida has another leading Millions contender, The Odyssey, waiting in the wings. The Odyssey returned to Schweida's stables on Saturday after a 10-day break following his Doomben win on October 20.